It is known to fund friends who failed in football, teammates often bring good fortune with gifts, and always stresses that he would love to children watching him to realize that anything is possible. "I was waiting for Roger Milla eight hours at the stadium, at the end gave me socks, he was a role model for throughout Africa. I do not know whether my brothers observe me from continent like this, but in any case I'd like to understand one thing - dreams can come true," said Eto'o. Cameroonian was yesterday hosted a ten year old boy who is suffering from liver disorders and who loves Eto'o whatever is not a fan of Chelsea. Came into contact with one foundation that has allowed him to meet an idol. Eto'o was soundly effort, brought a bunch of gifts for a boy, played football and entertained during the afternoon. In addition, he kid was a guest the the match with Manchester United in which Cameroonian scored three goals. Eto'o is paid and the arrival of the complete family of the boy, with him was a younger brother, and to them player showed various tricks on the field and taught them kicking a penalty. 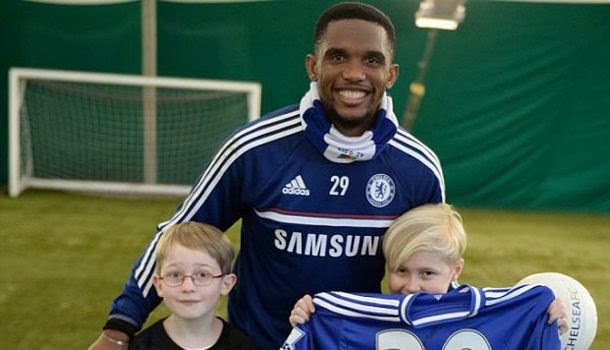 Given that brought him good luck against United, Eto'o has invited a boy to be his guest and the Cup match against Stoke. "I do not know who was happier, him or me," he said with a smile on his face Cameroonian.